French prose writer and poet, author of songs, a laureate of the prestigious IMPAC Dublin Literary Award (2002). In childhood he used his father’s name, however, when he grew up, he took his grandmother Henriette’s maiden name. He left France in 2000 to live in Ireland, and then in Andalusia. At the beginning of his adventure with literature he wrote mainly poetry. His first work, signed with the name ‘Michel Houellebecq’ was published in 1988. The La Nouvelle Revue de Paris magazine published five poems by Houellebecq under one title: Quelque chose en moi. One of the first important publications by Houellebecq was an essay about American weird-fiction writer, Howard Phillips Lovecraft, entitled H. P. Lovecraft: Against the World, Against Life (1991). 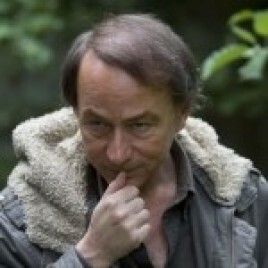 In 1998 Houellebecq published his second novel, Atomised, which went straight to the top of the bestseller lists, making its author the most popular author in France and all over Europe. Oskar Roehler directed a movie, The Elementary Particles, based on the book. The book, combining elements of a novel of manners, an essay and science fiction, generated a storm in France and the fact that the author was not awarded the Goncourt Prize was compared to the rejection of Cèline’s Journey to the End of the Night. His next novel, Platform, was published in 2001 and also aroused huge controversy – the book includes criticism of the Islamic fundamentalism and the French Arab League accused the author of spreading racial hatred; though in the end he was acquitted. In 2004 the writer changed his publisher to the Fayard company and a year later published his fourth and, so far, last novel, entitled The Possibility of an Island. Reviews of The Possibility of an Island had been published on the first pages of many literary magazines many months before the book was even published. The novel came out in a couple of countries simultaneously. The French publisher sold out the whole edition – consisting of 200,000 copies – within eight days of the premiere. Houellebecq himself directed a movie based on the book. Houellebecq is an exceptional portraitist, who knows how to maintain detachment from his work and has the ability to be inside the story and outside of it at the same time. He is thought to be an insightful accuser and critic of contemporary culture. He describes himself as a creator drawing on the tradition of realism, and admits to being influenced by Dostoevsky and, above all, by Balzac. The characters in his books are mainly sociopaths unable to adapt to life in today’s society, outsiders and recluses. The following four novels and one essay by Houellebecq have been published in Poland so far: Whatever, Atomised, Platform, The Possibility of an Island and the H.P. Lovecraft: Against the World, Against Life essay.